Scotland stunned me during the sunny, autumn days with bright sunshine and gorgeous weather. 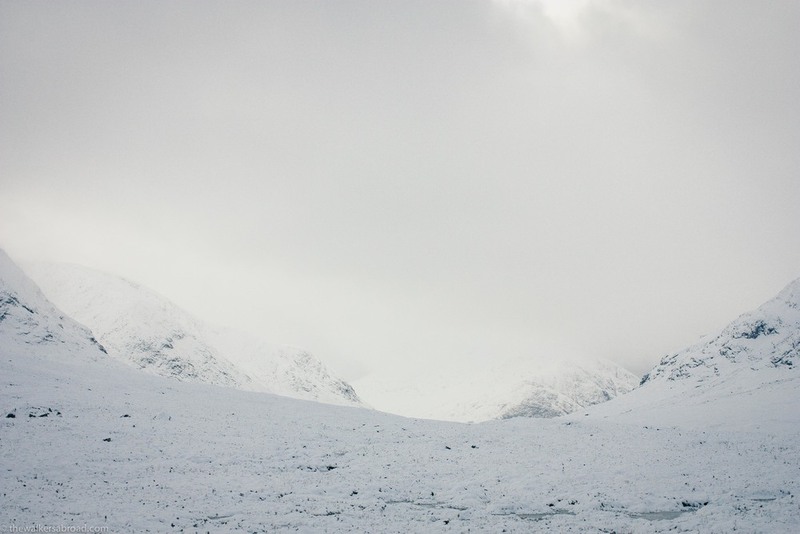 But this weekend when we drove north, I decided that Scotland in winter was the most beautiful sight I had ever seen. Our first stop was where we saw a beautiful red deer the last time we drove through. No red deer there today, but the trees were all decked out in snow! As we drove up the hill towards Glen Coe on the A82, the more snow we found. Fortunately the roads were pretty clear and there were several plow trucks clearing the way. Below, the road to Glen Etive was pretty impassable in our little compact VW. Buachaille Etive Mòr looking otherworldly as it appears out of the snowy mists. We stopped at one of the many parking lots and braved the cold for a few pictures. The wind blowing through the Glen was bitterly cold and I stood there for a few minutes before scampering back into the car. Glen Coe makes me feel so tiny! In the above picture, the road is a tiny little line on the right hand side. In the below picture, you can sorta make out the guardrails along the road before the bridge. We drove through Glen Coe and then turned right and headed towards Kinlochleven, which is located at the end of the Loch Leven. The town was small and we turned around once we got to the end, but the best part about the drive was looking up and seeing this beautiful red deer staring at us. We totally stopped in the middle of the road and got out and took some pictures of him before he turned away and disappeared into the snowy hills. Red deer on the road to Kinlochleven. Because of the snow in Glen Coe, we drove a bit slower than usual and we reached Fort William in the early afternoon. We decided that we would stay the night in Fort William and drive further into the Highlands on Saturday. We stayed at the Lime Tree Hotel, which was beautiful. Part of the Lime Tree is a restaurant and we grabbed a late dessert there after having dinner at a pub downtown. Additionally, they served a hot breakfast the next morning and it was superb. Because we went in the off-season, many of the B&Bs were closed, but it was fun to see the slower side of Fort William.